The Canon PIXMA iP8720 was built from the ground up to print photos—and it does it well. Simple setup, smooth operation, and fantastic print quality make this printer one of the best values dollar for dollar. The Canon PIXMA iP8720 is an interesting printer from Canon. While it’s at the top of Canon’s consumer-level photo inkjet printers, its feature set, and print quality rivals that of Canon’s much more expensive PIXMA Pro lineup. Sure, the PIXMA iP8720 can print documents, but its six-ink system and the ability to print borderless 13x19 inch prints show it’s clearly designed with high-quality photographic prints in mind. To see just how well the Canon PIXMA iP8720 performs, we’ve put it through the wringer to determine where it holds its own and where it could use improvements. 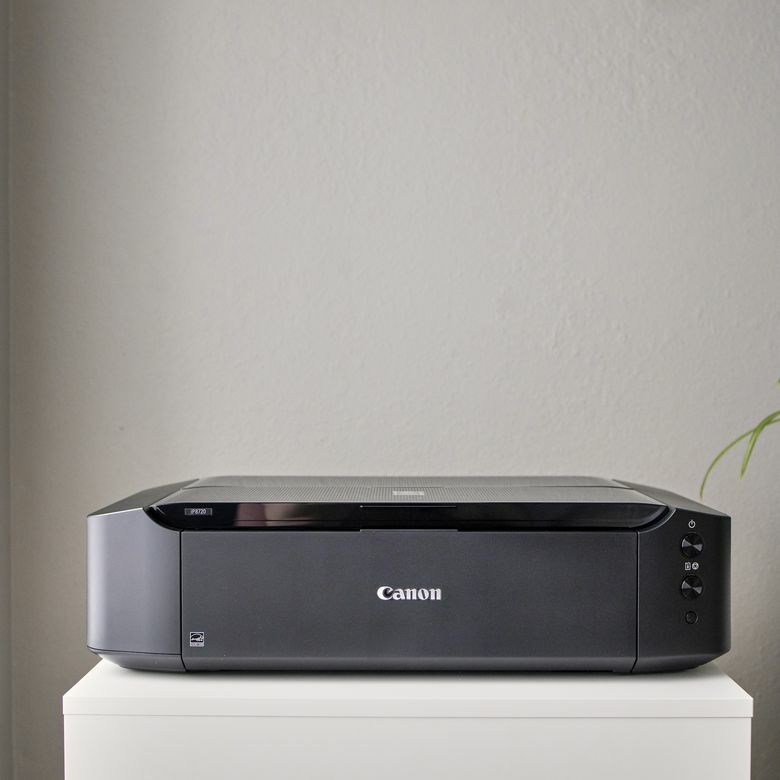 The Canon PIXMA iP8720 features a similar design to its predecessor, the iX6820, but adds a number of design elements taken from Canon’s professional photo printer lineup. Most notably, the flat buttons used on the iX6820 have been swapped out with the circular brushed metal buttons seen on Canon’s PIXMA Pro-100 printer and the high gloss finish has been exchanged for a more subdued gunmetal matte finish. The general shape of the iP8720 has also been squared off a bit compared to the curved edges of the iX6820. The size of the machine is quite large, at 23.2 x 13.1 x 6.3 inches and 18.6 pounds, but not massive considering it’s capable of printing borderless 13x19 inch prints. That said, you will likely want a dedicated stand or shelf for it, as it’ll take up a fair bit of desk real estate. We would’ve loved to see even a small touchscreen display to navigate the basic menu settings, view the ink levels, and be alerted of various errors when they arise during printing, but it’s not a necessity and certainly not expected at this price point. Another small but notable absence is an SD card slot, but without a display to use, it makes sense there isn’t an onboard memory card reader. Setting up the Canon PIXMA iP8720 is a painless experience. In the box, Canon provides everything needed to get started with printing: a power cord, a USB cable for wired connectivity, a set of six ink cartridges, a disc with the drivers and software, and accompanying manuals. To install the ink cartridges, turn on the printer and lift the top lid. The print head carrier will center itself, making it easy to install all six ink cartridges in place. Once the printer recognizes the cartridges are correctly installed, it will go through its initial calibration, which takes a minute or so in our experience. One it’s plugged in, turned on, and the ink cartridges are installed, it’s just a matter of plugging the printer into your computer and installing the required drivers and software, which can also be attained on Canon’s PIXMA iP8720 download page. If you’re not familiar with installing drivers for more advanced printers, this can get a little confusing, but Canon’s software has nice dialogues that should point you in the right direction so long as you follow the on-screen instructions. As for setting up the first print, there are multiple ways to go about this. For our tests, we installed Canon’s printer plug-in for Lightroom and printed our images directly inside Lightroom. In addition to presets you can use, Canon also allows manual control of almost every minute detail, from alignment to color profiles, so regardless of whether you want a more hands-on or hands-off approach, you should find just what you need. As previously mentioned, the PIXMA iP8720 is more than capable of printing every type of text document you can imagine at nearly any font size without any noticeable blemishes. If all you want is quality text documents with enough graphic power for complex charts or graphics, this thing will get the job done. But this thing isn’t for text documents—it’s a photo printer. We tested half a dozen photos on Canon’s 8.5x11-inch Pro Lustre paper and whether it was a high-contrast motorsports photo or a soft portrait with delicate skin tones, the PIXMA iP8720 held its own. If you’re in the market for a photo printer that won’t break the bank, you’ll be hard-pressed to find a better option than the Canon PIXMA iP8720. The PIXMA iP8720 features a nearly identical ink array as its predecessor, the PIXMA iX6820, however it adds an extra gray ink cartridge and additional nozzles for better ink flow. Its single tray, at the rear of the printer, holds up to 150 sheets of standard printer paper or approximately 20 sheets of photo paper, depending on the style and thickness of the paper being used. We tested half a dozen photos on Canon’s 8.5x11-inch Pro Lustre paper and whether it was a high-contrast motorsports photo or a soft portrait with delicate skin tones, the PIXMA iP8720 held its own. The maximum print resolution of 9600 x 2400 dpi was more than enough for borderless 8.5x11-inch prints. Multiple smaller prints on a single page also looked fantastic. The additional gray ink cartridge is a welcome change that made for extremely accurate monochrome prints. Canon says the ChromaLife100+ ink cartridges that are used inside the PIXMA iP8720 are rated to make prints that last more than 100 years, but we don’t have the time on our hands to put that to the test. Suffice to say, it’ll last a long time. Canon provides USB drive in the box for connecting to computers, but we opted to use the Wi-Fi functionality, which was quick and easy to set up, especially if your router offers Wi-Fi Protected Setup (WPS), as the printer has a dedicated WPS button on the front that makes setup quite literally a click away. The integrated Apple AirPrint and Google Cloud Print integration made it easy to print wirelessly from our laptops and mobile devices. Canon also offers a dedicated Android and iOS app of its own for wireless mobile printing. The Canon PIXMA iP8720 retails for $180, approximately $100 cheaper than its more professional-oriented sibling, the Canon PIXMA Pro-100. While $180 isn’t exactly cheap, the performance and print quality of the iP8720 rivals that of printers more than double the price point. A complete set of ink for the PIXMA iP8720 retails for around $65, so the ink itself isn’t too expensive either, meaning the long-term cost of the printer is a value as well considering the quality it offers. If you’re in the market for a photo printer that won’t break the bank, you’ll be hard-pressed to find a better option than the Canon PIXMA iP8720. The Canon PIXMA iP8720 is a bit out on an island in terms of competition. The Epson Expression Photo XP-8500 is roughly $80 more than the iP8720, which puts it more inline with the price of Canon’s own Pro-100 photo printer. However, the Expression Photo XP-8500 does offer an integrated display as well as a copier and scanner, which might make it worth the upgrade if you want your printer to do more than just print photographs. HP also has its Envy Photo 6255 all-in-one printer, which costs $40 less than the PIXMA iP8720, but the print quality isn’t nearly as high due to the lower resolution and use of fewer ink cartridges. Its resolution is only 4800 x 1200 compared to 9600 x 2400 with the PIXMA iP8720, and it can only handle borderless prints up to 8.5x11 inches compared to 13x19-inch borderless prints with the PIXMA iP8720. A professional photo printer at a consumer price. If you’re in the market for a photo printer that won’t break the bank, you’ll be hard-pressed to find a better option than the Canon PIXMA iP8720. It steals the best parts of Canon’s more expensive Pro series and manages to pack it into a much smaller and lightweight frame that’s easy on both your eyes and wallet.